We offer a huge variety of fixing and fastening products to meet your job requirements. Made from high quality materials and suitable for both light and heavy duty tasks our range varies from raw plugs to cable ties through to bolts and resins for all professionals and home DIY purposes. 4 X - 75 MM - 3" GRIP FENCE POST SUPPORT - Like Metpost Timber Holder Grip, Fence Post Suppo..
12 POCKET CANVAS TOOL ROLLBULK BUY 10 PACK 12 Pocket canvas tool roll with ties Fully stitched ed..
10 X - 100 MM - 4" BOLT DOWN BOLT GRIP Fence Support - Like Metpost Timber Holder Bolt Down,..
10 X - 75 MM - 3" BOLT DOWN BOLT GRIP Fence Support - Like Metpost Timber Holder ..
11 X - 75 MM - 3" BOLT DOWN BOLT GRIP Fence Support - Like Metpost Timber Holder Bolt Down, ..
12 POCKET CANVAS TOOL ROLL 12 Pocket canvas tool roll with ties Fully stiched edging. 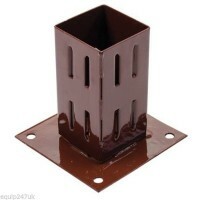 ..
13 X - 75 MM - 3" BOLT DOWN BOLT GRIP Fence Support - Like Metpost Timber Holder Bolt Down, ..
15 X - 100 MM - 4" BOLT DOWN BOLT GRIP Fence Support - Like Metpost Timber Holder Bolt Down,..
15 X - 50 MM - 2" BOLT DOWN BOLT GRIP Fence Support - Like Metpost Timber Holder Bolt Down, ..
16 POCKET CANVAS TOOL ROLL 16 Pocket canvas tool roll with ties Fully stitched edging. ..
2 x VAN SECURITY PADLOCK & HASP SET DOOR LOCK Need more security for your van? Then you'v..
JUMBO LADDER STORAGE HOOKS These Storage Hooks Are Ideal In A Garage Or Shed To Hang And Hold A B..
2 X - 75 MM - 3" BOLT DOWN BOLT GRIP Fence Support - Like Metpost Timber Holder Bolt Down, B..
Set of 2 New Keyed Alike 40mm Laminated Padlocks with 4 Keys Specifications: Set of 2 x ..